Not for the complete beginner or the faint-hearted, this "golden snitch" is a more complicated version of the traditional Japanese origami water bomb that many of us will remember folding as children. Although complicated, it is by no means difficult and it is very satisfying to fold. Perhaps you could use your golden snitch to decorate a Harry Potter party? Hang several around the room, or scatter them on the Hogwarts dining table. 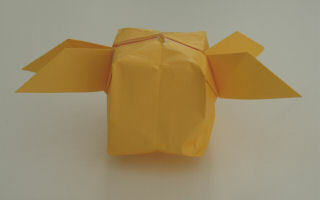 Maybe you could even invent your own version of quidditch using your origami golden snitch!